What Explains the Slowdown in Health Care Spending? John Goodman wrote a post, What Explains the Slowdown in Health Care Spending?, and included the following quote from a NYT article by Uwe Reinhardt. One concludes from this analysis that both year-to-year fluctuations in national health spending and the longer-term trend in that growth rate are driven primarily by current and prior-year changes in macroeconomic conditions. I was curious about how he reached his conclusions since it reminded me of the John McDonough’s macroeconomic premise in the article, “Does Massachusetts Have the Nation’s Highest Health Insurance Premiums? It Depends.” In that article Mr. McDonough speculated that the reason Massachusetts has the highest health insurance premiums in the country is because they have the highest median income. In other words health insurance premiums migrated to the highest price the Massachusetts market would bare. In Mr. Reinhardt’s article, Controlling Health Care Spending, Revisited, I found a fascinating graph of the year to year growth in real per capita health care spending. My immediate question is what happened to real per capita income over the same time frame? Since I know how to get income data from FRED here is my version of the two indicators on the same graph. 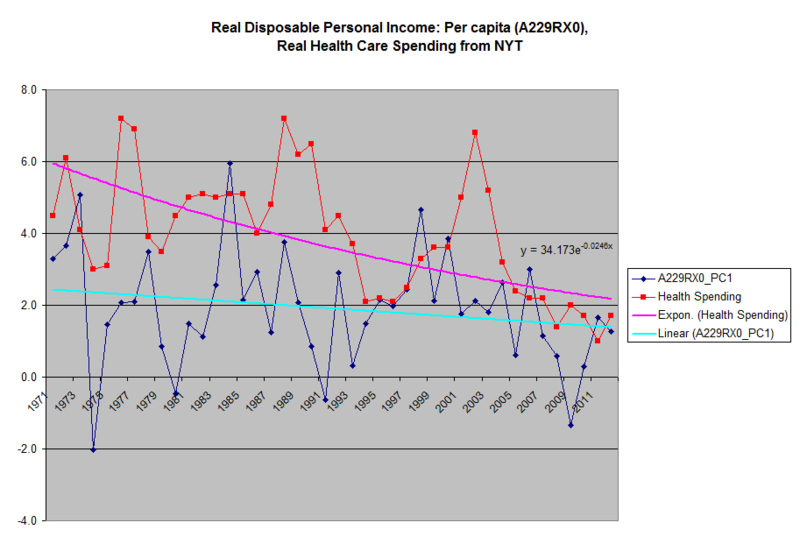 For those who are curious I estimated the year to year growth in real per capita health care spending from the NYT graph so I could put it into an Excel spreadsheet. It sure looks like the year to year increases are trending down to the increase in real disposable income. This would be a logical result in an environment where out of pocket costs are increasing and the country is increasingly sensitive to health care spending increases that exceed the general inflation level. If the large businesses and government entities that sponsor large group health insurance plans are unwilling to expand their contribution to health care spending, you have to wonder how we can expand our health care spending without a major increase in GDP and real per capita disposable income. If the predictions of slow GDP growth are correct then it looks like we are playing a game of musical chairs and the music is winding down. Even if there is no health care inflation then “someone” is being set up for a cost squeeze as we expand the health care system and its not likely to be the consumer. They look like they are tapped out. This reminds me of the typical problems faced by out of control entitlement systems. We have seen the future of health care and it looks a lot like Detroit. This entry was posted in Economic Forecasting, Healthcare and tagged FRED, healthcare. Bookmark the permalink.